You can never have too many braised tofu dishes in your repertoire. This one from Deborah Madison is a particularly good one. It’s a wok and rice pot meal that gets dinner done fast in the mid-week lull when all cooking inspiration has disappeared. I like to serve this with brown rice, but I’ve temporarily lost the battle of brown rice over white with my son and white rice made in the rice cooker makes this meal super quick and easy which makes up for the loss of nutritional standards. 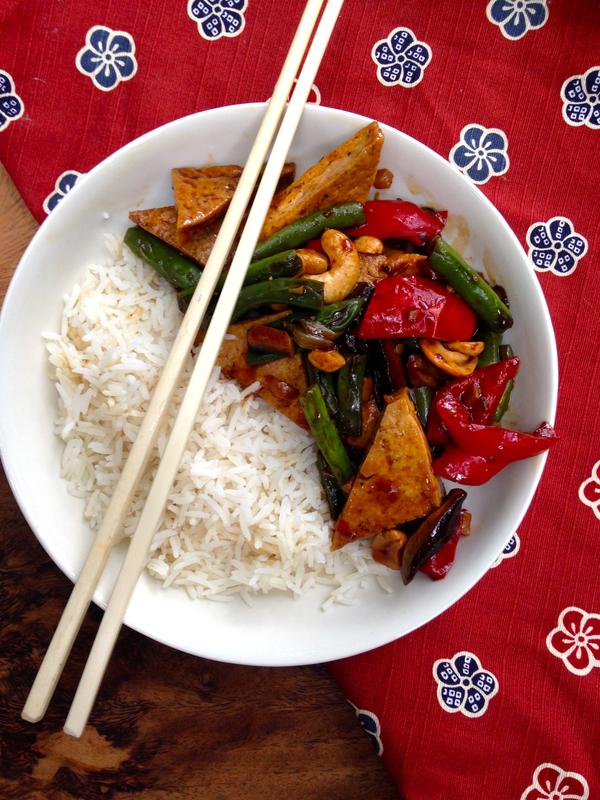 The original recipe calls for mushroom soy and roasted peanut oil both feature quite a bit in Madison’s recipes but I’ve never had with either of these ingredients in my pantry. Dark soy, oyster sauce or even vegetarian stir fry sauce makes a good replacement for the mushroom soy. The roasted peanut oil sounds like a great ingredient but I’ve never even seen it so I always substitute ordinary peanut oil or light olive oil. Cut tofu and red pepper into 3 cm (1 1/2 inch) triangles. Mix 1/4 cup of water, soy sauce, sugar, dark soy, finely grated ginger and sesame oil in a small bowl to make sauce. Heat 1 tablespoon of oil in large non-stick skillet or stir fry pan. Saute tofu on both sides until golden and remove to a plate. Add remaining tablespoon of oil to pan. Add garlic, beans, red pepper and mushrooms (if using) and stir fry for about two minutes. Add green onions and stir fry until green beans and pepper are just tender. Add tofu and Szechuan pepper season with salt. Pour in sauce and stir through gently, simmer for about a minute to thicken sauce before transferring to a platter. Sprinkle with roasted cashews and serve with rice.